Commercial Storyboards. Quickly drawn and rendered on screen. Above is a single panel from a commercial (advertising) storyboard. Drawn and rendered in Affinity Designer. 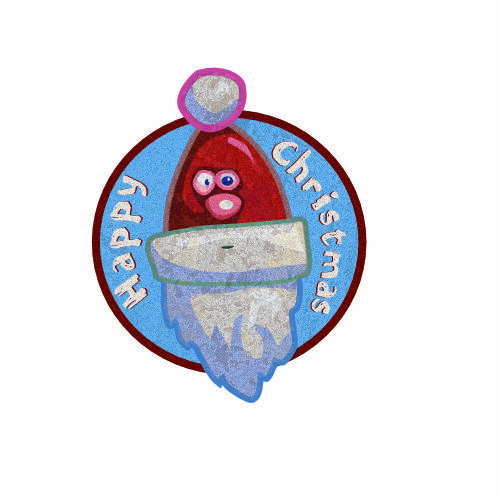 Call me on 086 247 0737.
from all at McSherry Towers. 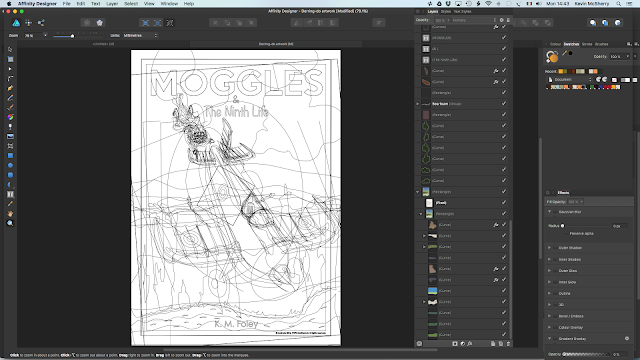 Digital Vector Illustration: Moggles – Ready for Takeoff! A digital vector illustration artwork for a book cover. Moggles & The Ninth Life. Yes, yes, I know. I’m late for my flight. There are a couple of reasons why I’ve taken so long to enter the world of digital illustration. For one thing, I love to paint and get my hands dirty and smell the paint and feel the brush in my hand. 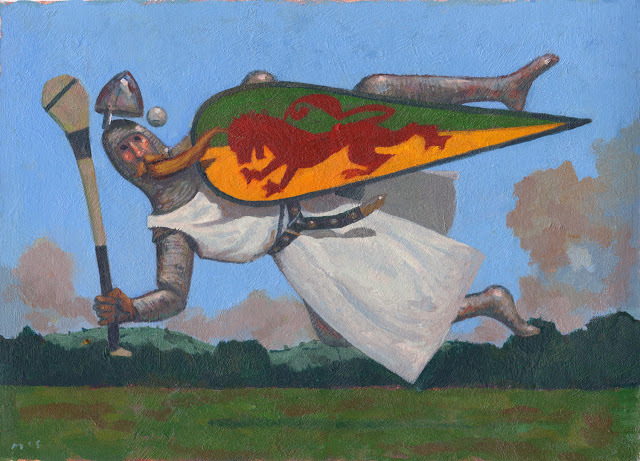 I became an illustrator to be a painter who gets paid properly from time to time. Another thing is, I did already try some years ago. For a while I used a program called Painter which promised to give painterly results but I struggled with it before giving up on it as I just couldn’t get the results I wanted. Then, Adobe introduced their subscription by the month, which is fair enough but it banjaxed my chances of using it. That’s when I discovered the Affinity suite of products: The software company, Serif, obviously saw an opportunity provided by Adobe’s move to subscription and the resultant flight of irritated users. They’ve introduced two extremely comprehensive and professional applications that are developing apace. It’s true that neither of the programs have the complete set of bells and whistles provided by the standard-setting Adobe products but if you know what you want to achieve in your work, there’s almost nothing that a photographer or illustrator can’t do. Add to that, Serif’s Affinity Publisher, which is due for release in about a year’s time to compete with Adobe’s InDesign, and it will be possible to move away from Adobe and still produce industry-standard results. A digital vector illustration artwork for a book cover in Outline Mode. 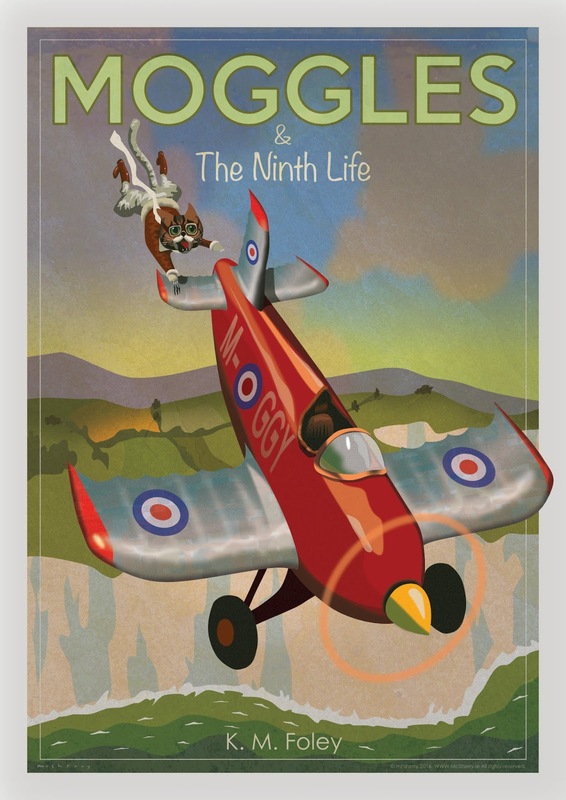 Moggles & The Ninth Life. So, illustrating this little ode to Affinity, is a cover illustration I did for a non-existent (as yet) children’s book. It’s made entirely in Affinity Designer and is a vector image. You can see something of how a vector image is made up in the above screenshot. I won’t go into the details of what that means except that I can reach into any part of this image and refine it, change it or remove it at will. Imagine trying to do that with a hand-painted illustration! This is the way things work with today’s illustration clients who have become used to making ‘after the fact’ changes, and I must change my way of working accordingly. Over and out. The Luan Gallery is delighted to announce its winter exhibition for 2016 entitled Without the Words. Celebrating the art of illustration, Without the Words is a group exhibition selected especially for Luan Gallery which showcases the brightest talents of Irish Illustration today. Showing works by a variety of artists, Without the Words includes samples by both established and high profile illustrators as well as emerging creative talents and forms a celebration of visual storytelling and the imagination. Without the Words is an exhibition inspired by a line from Emily Dickinson’s well loved poem: ‘Hope is the Thing with Feathers’. ‘In most circumstances an illustrator will respond to a brief which is communicated either through written or spoken word. As supporters of visual literacy, Illustrators Ireland propose to tell our visual stories, putting the pictures first- without the words. Here we tell our stories; visually stimulating the imagination to respond by creating an individual narrative, not a prescribed story’. Illustrators Ireland is a community of professional illustrators working together to actively promote the craft and art form that is illustration. Members offer a wealth of combined experience and amongst those exhibiting include Kate Greenaway Medalist and current Laureate na nÓg PJ Lynch, former Laureate na nÓg Niamh Sharkey, and 2016 CBI Book of the Year Nominee Lauren O’Neill. 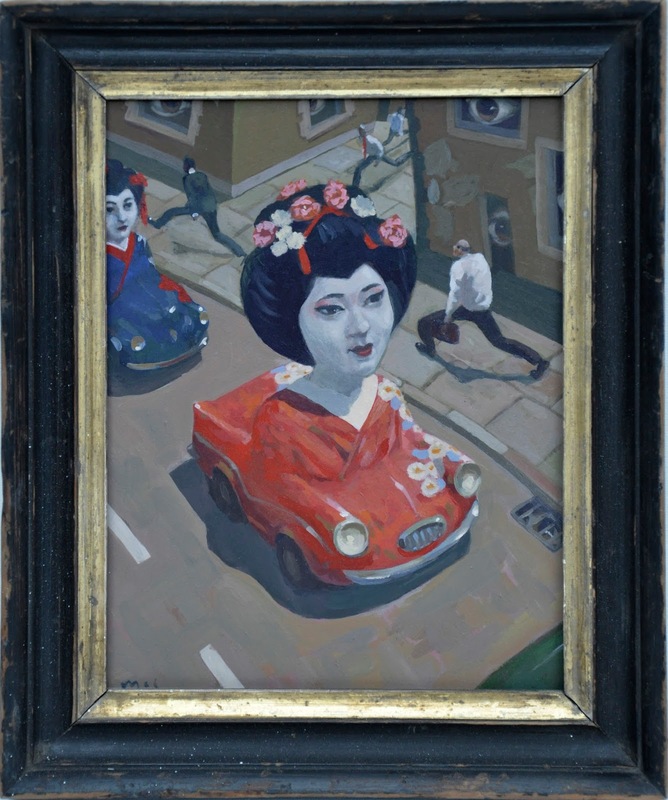 With over 40 members’ work on exhibition, visitors are invited to find their own narratives within the original works. The show combines computer generated imagery with traditionally executed drawings to present an assortment of colourful scenes and images to ignite imagination and discussion. Speakers at the official exhibition launch include: Aoife Murry from Children’s Books Ireland, Margaret Anne Suggs from Illustrators Ireland and PJ Lynch, current Laureate na nÓg. The exhibition will open on November 5th at 6pm with a wine reception to which all are welcome and continues until 27th January 2017. 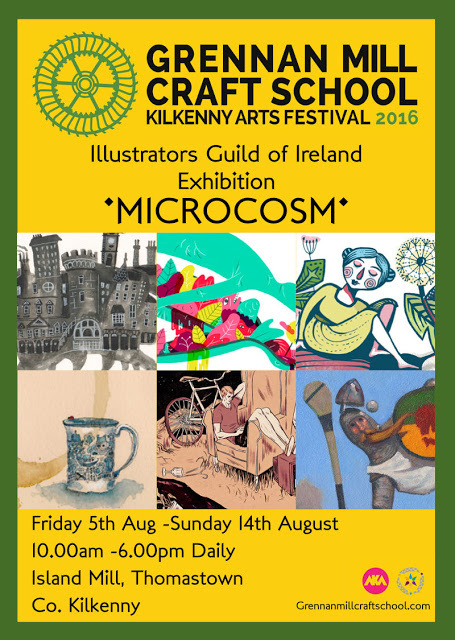 There’s an Illustrators Guild of Ireland group show coming up soon (I’ll keep you posted). It’ll be in the Luan gallery in Athlone to begin with but will then swim around the country. The IGI has done quite a bit of that kind of thing; it works a treat to get the membership known more widely. I had the presence of mind to film part of the process of making this painting only at the outset -as usual, I then became embroiled in the little world I was creating and forgot about the camera. Still, that makes for a short, easy to view movie. It’s only a minute long although the artwork took about twelve hours to complete. There’s a bit of lively, upbeat jazz to help you with your viewing, so if you’re at work, do turn the volume down! An acrylics on paper absurdist painting of a fish for an exhibition with the Illustrators Guild of Ireland and Luan Gallery in Athlone. I painted a complete underpainting in monochrome first, which is a technique that I’m currently teaching in my art class (it’s the friendliest and best art class in the entire world!). 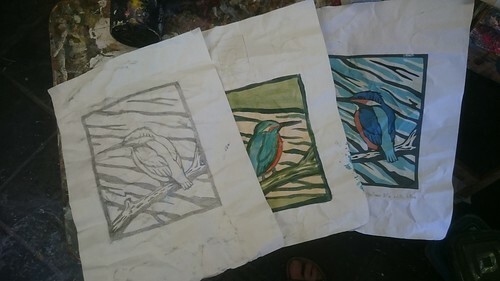 The method is very popular with my students as you can provide yourself with a lovely ‘safety net’ before you ever embark on the colour work. Speaking of nets; this art is for a curated show, so everyone has to submit their work for review, so there is the possibility of rejection and being thrown back in the lake. Fins crossed. You’ve probably noticed that the background isn’t New York or London -I made it up, but it does have the big city feel about it. 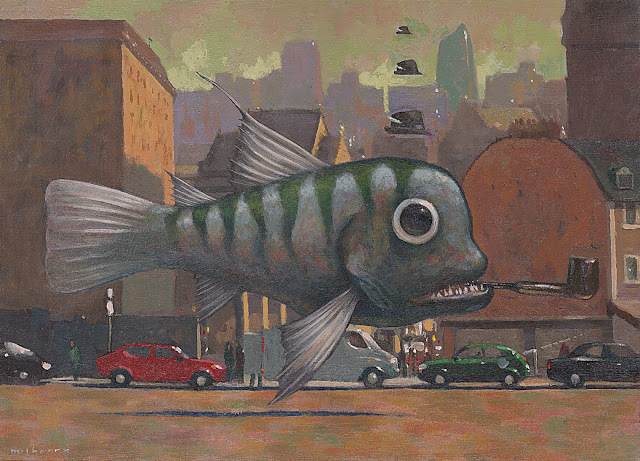 I fancied that the fish could be some kind of Don Draper figure, arriving in Manhattan to his ad agency. A big fish in a huge pond. After all, the piece does have a kind of fifties retro feel. Acrylics on gessoed panel in antique frame. 11”x 9” Available to buy. We just got back from France on a late flight last night. A long journey to Beauvais airport from Merlimont in 30º heat and back to half that in Dublin. Still, it’s great to be home, whatever the weather. A few weeks ago, I slammed the seat of my motorbike down on top of my lovely smartphone and, wait for it…then rode off for about twenty miles before I needed to call home and couldn’t find my phone. After going through the usual process of patting my pockets and shuffling around in small circles looking in the grass at the roadside, I realised what I’d done. There was my phone, wedged nicely at the hinge end of the seat. I stared at the mangled phone and made tiny sobbing noises for a while. I also uttered very many oaths and curse-words but to no avail. The upshot is, I was mostly offline for the week in France, which turned out to be a good thing as I wasn’t peering into the screen looking for signs of work projects which weren’t there anyway. I used instead, an old Nokia phone which we keep as a backup for my frequent phone mishaps. I find it amazing how I’ve been seduced by the promise of always-on connectivity. I felt bereft because I couldn’t post anything to social media. Pathetic. So, I’ve made a decision and it’s final: I’m going straight out this afternoon to buy another smartphone. 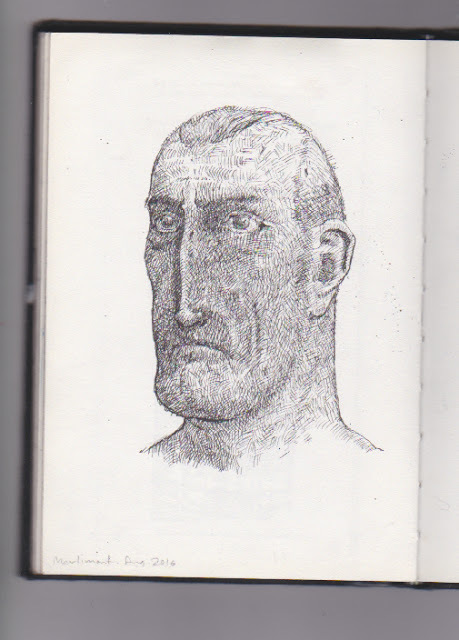 Below is a drawing from my sketchbook. It’s cross-hatched using a fine-line pen. I was leafing through a French copy of Graffiti Art Magazine and came across an artist from Catalonia who calls himself Popay. It’s difficult sifting through another language for details when you’re standing in the middle of a newsagent’s shop reading the magazines when they want you to actually buy one. After seeing the €7.90 price tag, I spent some time pretending to browse other magazines and then patting my pockets as if I’d forgotten my wallet, I exited the shop, replete with half-learned information. (The things I do for research, honestly: I should be awarded with l’Ordre national de la Légion d’honneur for services to art.) There were some drawings of Popay’s reproduced amongst all the colour work. I really liked them and that sparked off a series of sketches in my sketchbook. This shows the bould Sir William in the famous hurling match between Kilkenny and Tipperary in 1214. Kilkenny pipped it as they had heavier cavalry and crossbows. Acrylics on Arches watercolour paper. A5. The Illustrators Guild of Ireland (IGI) is taking part in an exhibition at the Island Mill in Thomastown starting on August 5. I’ll be part of it with my painting ‘Sir William Marshall’, below. I’m currently engaged in making another linocut limited edition print (of 25). 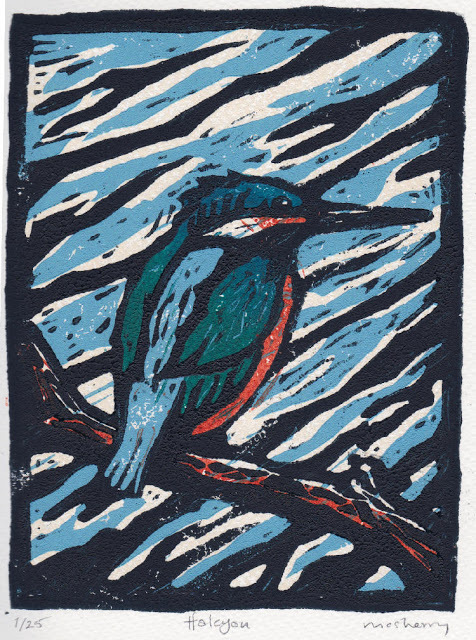 I wanted to make the description of the kingfisher a little simpler as I have only 5 flat colours to work with. Also, I had to make a jig to make registering the plates more accurate and not have the colours printing in the wrong place. I chose to print on a fine grain watercolour paper instead of a smooth one as I want to see texture rather than a purely flat colour. This introduces yet another variable to the process which makes each print unique. 3 of these are already sold. The image is roughly A5 on an A3 sheet of Fabriano fine grain 140lb watercolour paper. Signed and embossed with my studio stamp. “Halcyon”. Unframed €95. 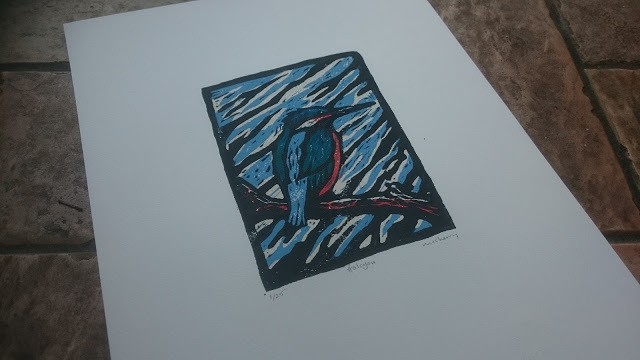 Order this handmade, original print here on Etsy.